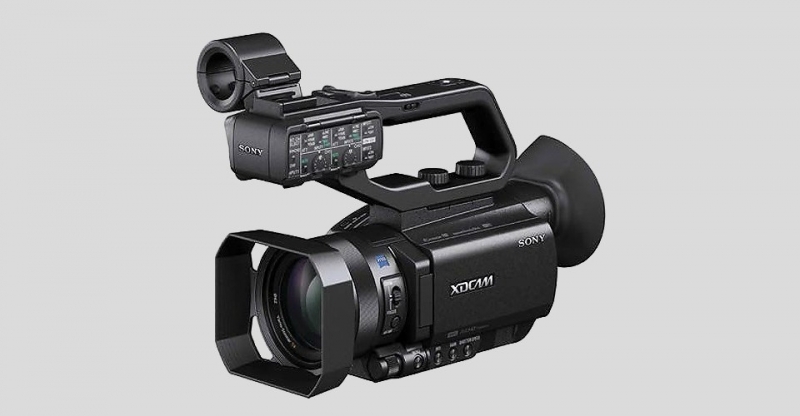 Featuring a compact camcorder size and shape, a first for Sony’s XDCAM line of cameras, the new PXW-X70features a 1” type sensor which is eight times larger than the 1/3” size usually found in this kind of camera. Although the sensor is not as large as a 35mm sensor, it is larger than a Super-16 , which helps you achieve a more cinematic image with shallow depth of field. Common to the XDCAM line, the PXW-X70 features a Back Side Illuminated Exmor R sensor. The design of the sensor moves the photodiodes above the control circuitry, providing better low-light performance with noticeably less noise. However, the large 1” sensor and small form factor are not the only features worth noting. The camera, which records broadcast quality 1920 x 1080 HD video using a variety of codecs, at 4:2:2 10-bit, is planned for an upgrade that allows it to shoot UHD 4K, so you get a compact HD camcorder now, that can be upgraded to 4K in the future without having to buy a new camera, something to consider as 4K production becomes more and more common. Two SD Media Card slots allow you to record either simultaneously or in relay mode, so you need never actually stop recording, except to change batteries, as you can swap a full card for an empty card while the camera records to the second card. "...you get a compact HD camcorder now, that can be upgraded to 4K in the future without having to buy a new camera..."
The camera is Wi-Fi enabled and uses NFC (Near Field Communication) to enable wireless LAN connections. What this means to you, is that you can control the camera via smartphone or tablet with the Content Browser Mobile Application, which enables you to adjust focus and iris, as well as confirm your shot angles. Future planned upgrades will allow you to stream live from the camera and transfer files wirelessly as well. Though small in size, the camera does not skimp on features that professionals expect. Two 3-pin XLR inputs in the top handle allow you to work with professional microphones and cables, just as you would with a full-sized camcorder. Suitable for tripod work and hand holding, the camera features an ergonomic palm grip with a large zoom lever, and an eyepiece viewfinder with a large eye-cup. The built-in 12x optical zoom lens incorporates three selectable ND filter settings, and Clear Image Zoom extends the 12x optical zoom to 24x while maintaining HD quality. If you're looking for an HD camera that combines file recording to commonly available recording media, a compact form factor, wireless control via smartphone or tablet, a built-in lens with manual focus/iris ring, and a future upgrade to 4K, the Sony PXW-X70 camera is well worth taking the time to check out.